Naomi Osaka is a Japanese–Haitian professional tennis player. She is most famous for her upset victory over Serena Williams in the U.S. Open on September 8, 2018. Beginning her professional career in 2013, Osaka has made many significant achievements. In 2018, Osaka reached her highest singles world ranking as number 21. In 2016, the WTA named Osaka the 2016 Newcomer of the Year, and when she was nineteen, she was the second-youngest player in the top 100. Osaka was born in Osaka, Japan on October 16, 1997. Osaka is the name of her mother’s, Tamaki, ancestral land. Her father, Leonard Francois, is from Haiti. Osaka has dual citizenship, but chose to represent Japan. However, she was raised in the United States and considers New York City, New York and Fort Lauderdale, Florida her home communities. Currently, Osaka resides in Florida. She graduated from Elmont Alden Terrace Primary in Fort Lauderdale, and her club was Harold Solomon Institute, Pro World Tennis Academy. Growing up, Osaka idolized Serena Williams. She also looked up to her older sister, Mari, who also played tennis, but never achieved similar success. Osaka’s family moved from Japan to the U.S. when she was in preschool, which is the time when Osaka started to play tennis. When Osaka got more serious about tennis, her family traveled to Japan to discuss training with the Japanese Tennis Association. In addition to their resources, her father also believed an allegiance to Japan was a smart decision. Traveling in Japan, Osaka discovered that many people she encountered were surprised by her name and appearance. During off-season, Osaka has been trying to learn the Japanese language, so she can more effectively answer media questions. Osaka practiced and played Futures and Challengers, and entered the US Open Girls in 2011. Surprisingly, she won a match with the much more experienced Samantha Stosure. Afterwards, Osaka was a runner-up in an El Paso (Texas) Tournament and entered the 2013 French Open Girls. After many amateur successes, Osaka turned pro in 2013. Technical coach Patrick Trauma, who has trained many of the top 50 players in the world, started coaching her when she was fifteen. The Japanese Federation also supported Osaka, as her multi-ethnicity made her very marketable. After working with Trauma, Osaka’s wins qualified her for the 2016 Australian Open. Additionally, Osaka recorded a 125 mph serve at the 2016 U.S. Open, which only eight women have topped. When Osaka turned eighteen, she lost age restrictions on the number of matches she could play. Osaka started competing against big names in 2016, as she made the third rounds of the Australian and French Opens in her appearances in the main draws of Grand Slams. One of her biggest milestones was reaching the final of Tokyo’s Pan Pacific Open in September 2016. Throughout her career, Osaka’s main tennis strength is her massive forehand, which helps her powerfully serve and aggressively play at the baseline. She has been described as charismatic, open about her strengths and faults, and honest about her ambitions. Even Serena Williams stated she is “very dangerous.” Most recently she achieved 1st place in the 2018 Indian Wells, California open. Osaka plans to participate in the 2020 Tokyo Olympics under the Japanese flag. Osaka’s most inportant victory came when she defeated Serena Williams in the 2018 U.S. Open. The victory was marred by numerous penalities given to Williams which ultimately cost her the championship. Adi Joseph, “Who is Naomi Osaka”? 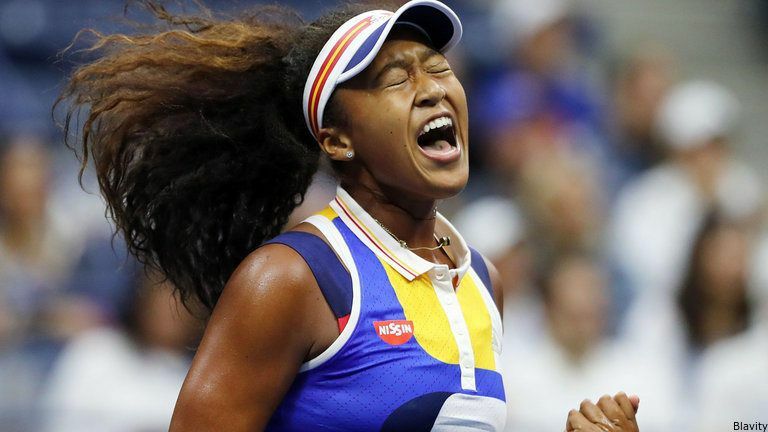 19-year-old stole U.S. Open spotlight with Round 1 upset”, USA Today; https://ftw.usatoday.com/2017/08/naomi-osaka-us-open-kerber-upset-japanese-haitian-serena-williams; Louisa Thomas, “The Thousand Autumns of Naomi Osaka”, Racquet Magazine, https://racquetmag.com/2018/03/19/the-thousand-autumns-of-naomi-osaka/.